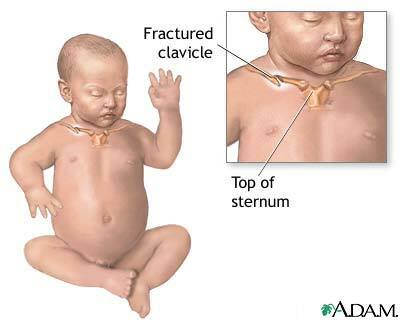 The clavicle is also known as the collarbone and is the bone that runs from the sternum to the shoulder joint. During labor this bone can be fractured and this injury is fairly common during difficult vaginal deliveries. Generally, there is no treatment other than lifting the child gently to prevent discomfort. Occasionally the arm on the affected side may be immobilized.